Why would I want to address accessibility in my organization? Because it’s bad business to consider the 20% of the population who have disabilities as an ‘outgroup’. In-Depth answer: Why would I want to address accessibility in my organization? “As well-intentioned people, we believe we are inclusive of others and would conceptually support the idea of being inclusive. In company wide training videos captions are added to allow inclusion of people who are unable to hear. In order to be truly inclusive, every aspect of technology in organizations should be considered in terms of whether it can be used by someone who doesn’t have the same functional capabilities as the majority of the population. The question that is presented to us is whether to make the conscious choice of opening up the spaces, the technologies, the social groups to the minority outgroup? We know that even with the best intentions, this is not necessarily a straightforward question. There are risks and opportunities to weigh, and costs and benefits to mull over. This article covers the main issues, and provides pointers to further information on addressing accessibility in your organization. The medical model. In the medical model, disability is considered to be caused by disease or injury. Access for people with disabilities is resolved by healing the cause of the disability, or by providing other medical interventions that help alleviate the symptoms of the disability. The social model. In the social model, disability is considered to be caused by the way things are designed. Access for people with disabilities is provided by modifying the technologies around us, and by changing social attitudes and behaviors. Both models have their place, of course. If we are in the healthcare field, we care deeply about the medical model of disability to drive innovation, advance healing and produce better prosthetics and other aids to daily living. The medical model came before the social model. The old ways of thinking were convenient before the days of customization, and before the easy availability of technology solutions for access. For example, before the introduction of hand control options for driving cars, people who had no use of their legs were precluded from driving cars. Prior to hand controls as a solution, car manufacturers wouldn’t have considered people with paraplegia as part of their target demographic. In this example we can see how the medical model (not our demographic) gives way to the social model (technology modifications are available) over time as new inventions and innovations enter the market. The last few decades have seen a massive growth in the availability of solutions for providing access to technology. There are readily available solutions for computer access (the web, and desktop software), for hand held device access (smart phones), public use technology access (information kiosks, ATMs and ticket machines), and more. Digital Outcasts: Moving Technology Forward without Leaving People Behind is a book by Kel Smith. The book covers the digital gaps that exist, the role of innovation in accessibility, and tackling accessibility strategically. There’s an expanded market opportunity. Give or take depending on how you make your measures, approximately 20% of the population has a disability (a reduced ability to do something, or an inability to do something due to disease, injury, or as a natural result of aging). While there isn’t a magical bump of 20% additional sales when you make your products and services accessible, there is the opportunity to expand your market and surpass your competitors in new areas that you may not have considered before. For more, read Including Your Missing 20% by Embedding Web and Mobile Accessibility by Jonathan Hassel. Better accessibility can mean better usability for all. By making your products and services accessible, there can be fortuitous consequences for all users. For example, more people who can walk (but have their arms full carrying bags and phones) use automatic door openers (the ones labeled with the wheelchair symbol) than actual wheelchair users. The concept of ‘universal design’ is that accessibility features added to mainstream environments and technologies mean better usability for people experiencing temporary functional limitations that may not be traditionally considered as ‘disabilities’. The same features used for accessibility are expected best practices for use in mobile, responsive design, and functions all users expect. For more, read Universal Design: Creating Inclusive Environments by Ed Steinfeld & Jordan Maisel; and Universal Design for Web Applications by Wendy Chisholm & Matt May. A diverse workforce fosters diverse and innovative ideas. There’s a common but mistaken assumption that having people with disabilities in one’s workforce is going to be a hindrance. As a result, many companies hire people with disabilities based on minimum suggested quotas, if at all (as Helen Turnbull says, “Companies hire for diversity and manage for similarity”). Such misconceptions and missteps can obscure the opportunities that having a diverse workforce can bring. For more, read Tapping into Hidden Human Capital: How Leading Global Companies Improve their Bottom Line by Employing Persons with Disabilities by Debra Ruh. Corporate social responsibility counts. As the above quote from Kel Smith suggests, in terms of social responsibility, inclusive design may be the new ‘green’. It would be a bit out of place to say “We’re a socially conscious organization, but we just don’t care about whether we poison the atmosphere or not.” Recycling, energy efficiency, charitable giving, responsible investing, inclusive practices. That last one is becoming less of an omission in corporate life. Companies are realizing that promoting inclusion is not just good advertising, it’s good business. For more, read the Advertising & Disability blog by Josh Loebner. It’s the right thing to do. If accessibility has been an oversight in the past, it’s better to be late than never, to fix it. Other guides and articles in the Accessibility Switchboard (see links below) can help you figure out how to get started. Developing a Web Accessibility Business Case for Your Organization is a website from the World Wide Web Consortium Web Accessibility initiative (W3C-WAI). The site includes guidance on various factors (social, technical, financial, legal/policy) and how these can be used in presenting a business case for addressing web accessibility in your organization. Laws get made when there’s a difference between what society wants to happen and what is actually happening. In our consideration of ingroup and outgroup, we can reference early efforts such as women’s suffrage and racial equality through civil rights legislation. Disability laws have also been on the books in the US for decades, notably the Rehabilitation Act of 1973 and the Americans with Disabilities Act of 1990. Laws and regulations can only exist where technological solutions exist. In other words, you can’t create a law that says that all car manufacturers must make at least one self-driving capable car, because currently the technology isn’t proven. One day it might be, and that would be the time to explore laws if compelling marketing arguments were not driving voluntary adoption of such a standard. The accessibility laws of 1973 and 1990 covered certain technologies and public use environments of their time, and have since been updated in 1998 and 2008 respectively. The existence of a law or regulation is not enough on its own. Lawsuits and legal claims are brought by plaintiffs when companies resist their duties as described in legislation. While the general wisdom is that lawsuits should always be the last resort, they do happen, and are becoming more and more common when companies refuse to make their Information and Communications Technology (ICT) accessible with readily available solutions. Compliance with legal regulations is therefore a means of lowering the risk of being the subject of complaints and lawsuits. However, we would assert that the business motivators given above should be given more weight than the legal arguments for compliance. Making adjustments to your daily operations, just because you are legally bound to, keeps the idea in place that you are doing something for this outgroup that is against your wishes. It’s better, easier, and more productive to stop thinking in those terms, and just think instead of having a more expansive, more progressive, more inclusive singular ingroup. Ensuring Digital Accessibility through Process and Policy is a book by Jonathan Lazar, Daniel F. Goldstein, & Anne Taylor. The book covers US and international laws, regulation, and standards, as well as guidance for compliance monitoring and organizational culture change. The Guides section provides advice on How to get started with accessibility for small businesses and startups, as well as a Roadmap for inclusion for large ICT vendors. 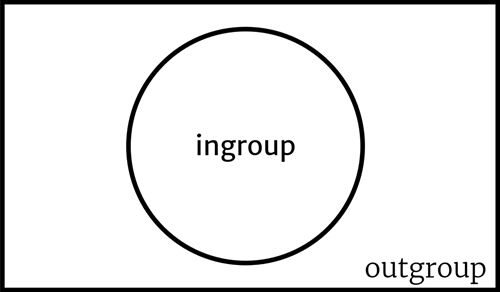 ‘Ingroup/Outgroup Venn’ by Chris M. Law & The Accessibility Switchboard Project. CC BY-SA 4.0.